Hello there! 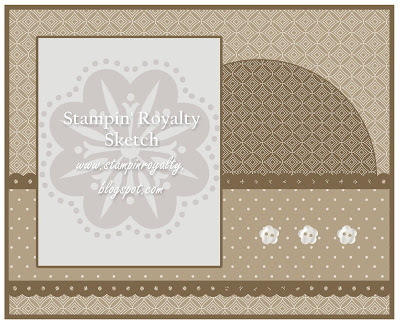 Here is today's Stampin' Royalty challenge #120. This week's challenge is a sketch. 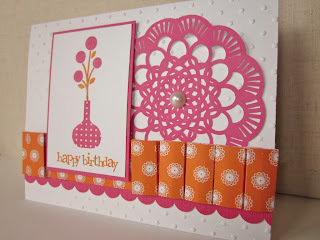 I love the circle peeking out, and the fun border. Grab your supplies and play along. We would love to see what you create. March and April seem to be the month for birthdays, I know of at least 6 cards that have been sent out in the last few weeks. WHEW! This card is for my daughter's friend that we have known since they were two. I thought the colors are young and fresh, just perfect for a 14 year old girl. The birthday image is made up of two stamp sets, Party This Way, and a brand new set that is part of the summer smooches promo, Bright Blossoms. 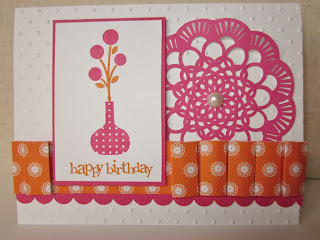 I colored the stamps with my melon mambo and pumpkin pie stampin write markers. 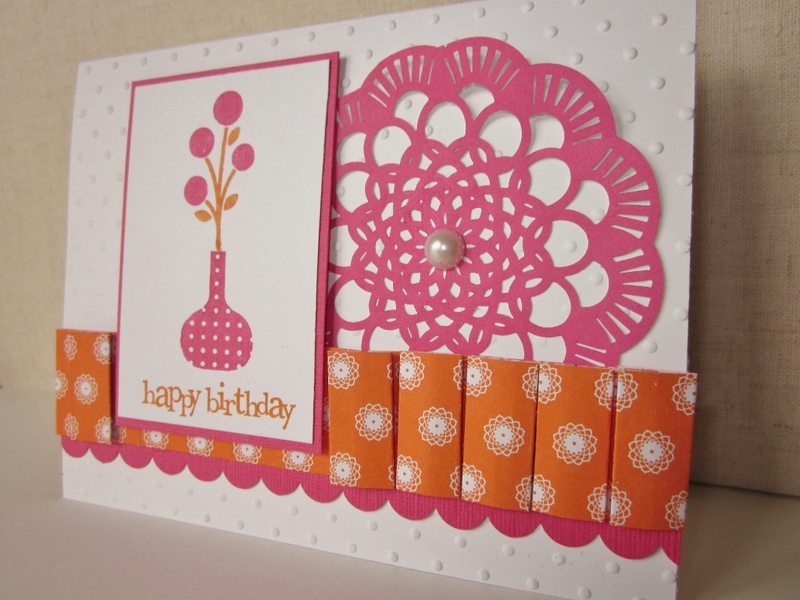 I resisted the urge to bling up the flowers since I wanted a CAS style for this card. This pleated Flirtatious SDSP paper is a great use of the simply scored tool. I alternately scored at 1/4 and 1/2 for a box pleat look. 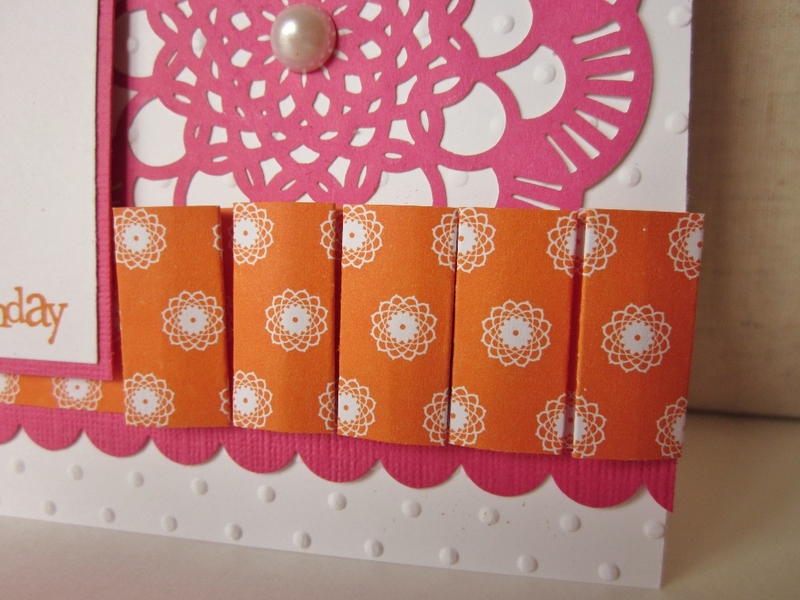 A strip of melon mambo textured cardstock was punched with the scallop border punch. I flattened out a part of the pleated paper and fit my main image panel snugly inside. 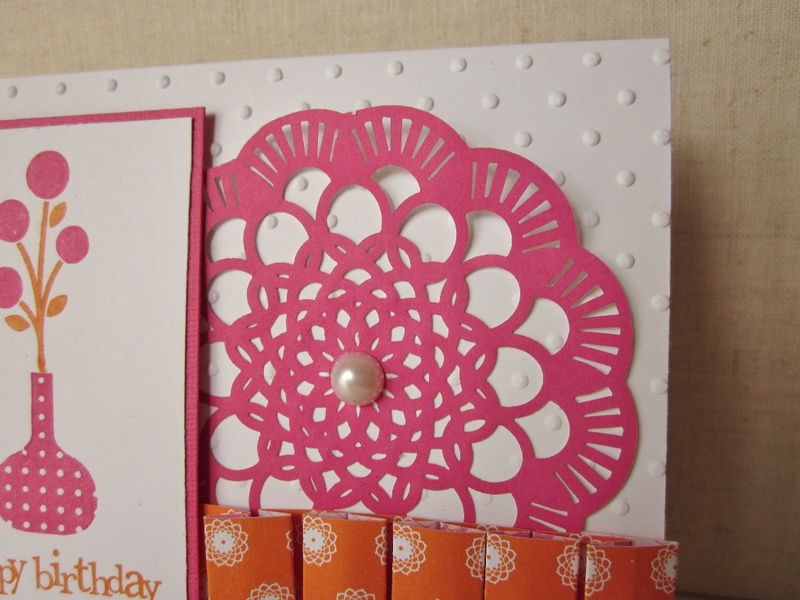 This laser cut doily also came out of the Flirtatious SDSP pack. I have been hoarding them, and now is a great time to use them up. 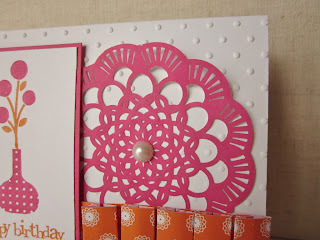 The perfect polka dots embossing folder is just perfect for the whisper white background. A large basic pearl dresses up the center of the doily. 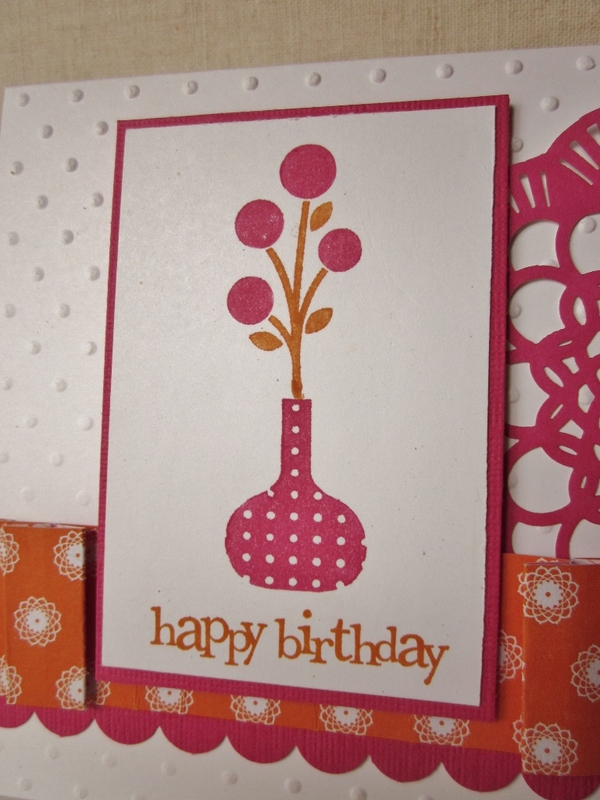 There you have it, a pretty in pink birthday card. Make sure you come back tomorrow for my Pals Paper Arts card, here is a little peek to wet your whistle. Thanks for stopping by, hope you were inspired, enjoy! Love this pink & Melon Mambo together! 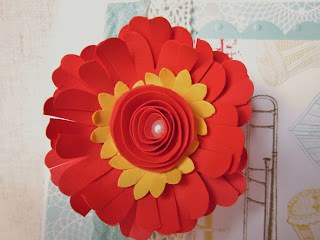 I'm just getting around to ordering Bright Blossoms and they look to be a lot of fun! Such a pretty spring card! The colors are so perfect together! 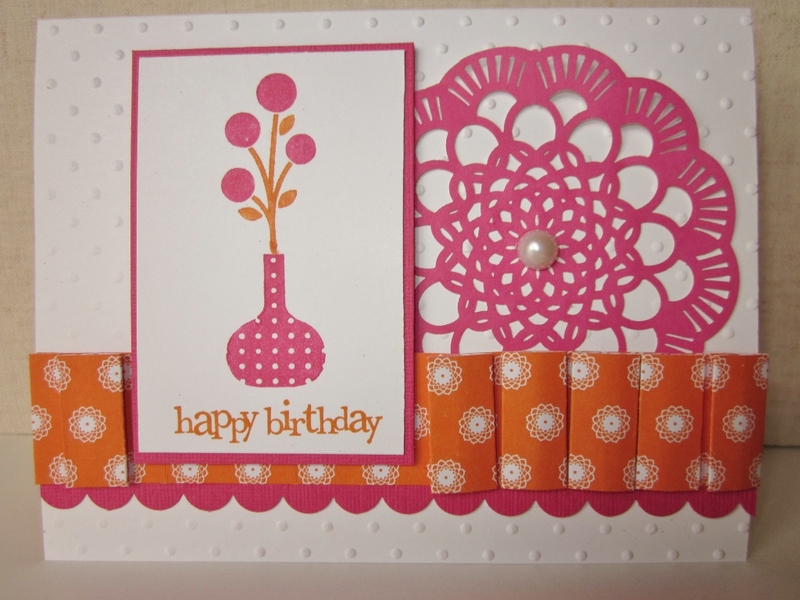 Love your card and the use of the doily, I used the paper doily on my card as well, great minds think a like! 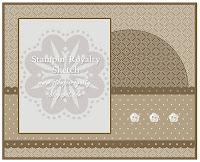 Glad to have you designing with us at Stampin' Royalty! This is Pretty in Pink for sure - love the pleats! How to get your FREE catalog!